The National Holocaust Museum is quite possibly one of the most painful experiences anyone can have at a museum. It is an unsparing monument to one of the greatest horrors the human race has ever perpetrated against itself. You will walk away from it forever changed. Or just with a Snorlax and a Jynx, if you’re a terrible human being obsessed with Pokémon Go. 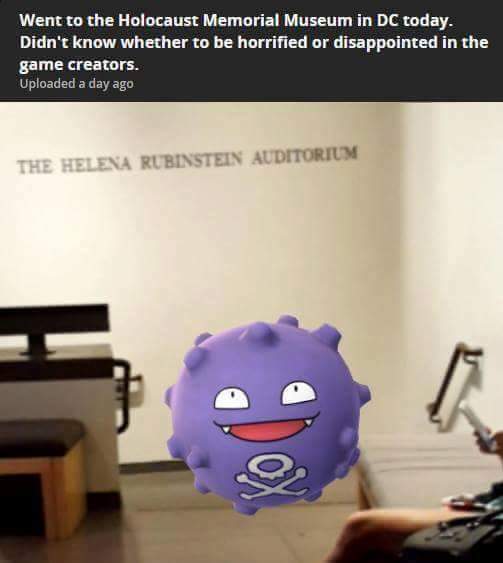 On Monday afternoon, there were plenty of people inside the museum who seemed to be distracted from its haunting exhibits as they tried to “catch ’em all.” A player even used a lure module, a beacon that attracts Pokemon to a specific PokeStop, on the museum’s marker — making double-headed bird-like creatures dubbed Doduos and rodent-like Rattatas practically swarm on users’ screens. Needless to say, the museum is extremely unhappy about people trying to lure fantasy creatures to a metaphorical graveyard. Nor does the Pokémon you catch there really help matters, although we doubt that was intentional. The museum is looking into how to remove itself from the game, which is something Niantic really should have anticipated. For now, Pokémon Go players should be considerate of their surroundings and put their smartphones away in certain places. That goes double for Auschwitz.